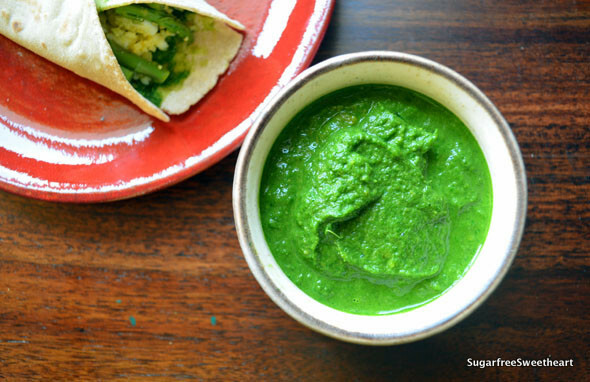 Everyone loves a good green chutney – it’s got spice, flavour, and colour all in one condiment! Inspired by the Cilantro Chilly Sauce Frittata that I had at Egg Factory, I came up with this coriander chutney that goes especially well with egg in any form. The batch of chutney pictured below accompanied Jowar-Atta Rotis with Asparagus and Boiled Egg filling. So what’s different about this chutney, you ask. First, it really is that green when freshly made! Second, it’s got urad dal (black gram) which gives it a slight creaminess and finally, it’s got lemon instead of tamarind and that gives it a fresh, spunky taste. This recipe is suitable for everyone – the makers, the eaters, the salads, and the omelettes! Six simple steps is all it takes. Seriously, you don’t need any TIPS for this one! Just remember to make it in small batches because it tastes best fresh! How could I miss this post? I’m a chutney addicted. Recipe bookmarked! Thanks. It’s an easy one and goes well with all sorts of things! Hi Priya, I tried it over the weekend – and? It was SUPERB!!! the urad dal gives it such an earthy flavor that we kept dunkin our fritters deeper and deeper. 🙂 Yumm. Thanks for the recipe. I tried this 🙂 Its yummy! Thank you! Great illustrations, Priya. Way to go, girl!! And of course, great recipe.